The stairway can be much more than a pedestrian’s path to the next floor; it can be a memorable focal point in your home that welcomes guests and sets the tone for your interior decor. 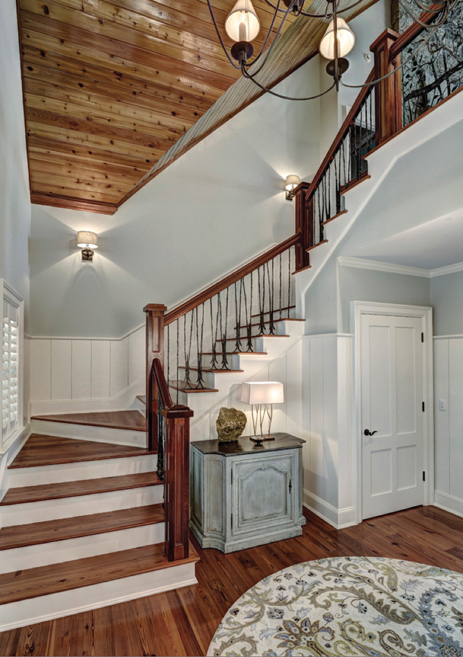 There are many unique elements you can incorporate into your stairway’s design to elevate its appearance and transform it into your home’s most spectacular architectural feature—whether you’re building a house and designing a new stairway, or considering a remodel on an existing one. 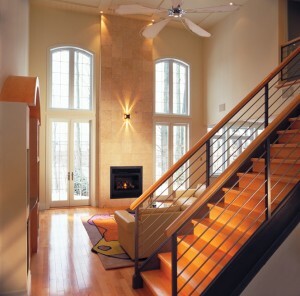 Your stairway can contribute an elegant, modern or traditional vibe to your home, so it’s important that your staircase fit both the architecture of your home and your personal aesthetic. You can remodel the entire stairway or just a portion of it (or, you can tear the whole thing out and start over!). 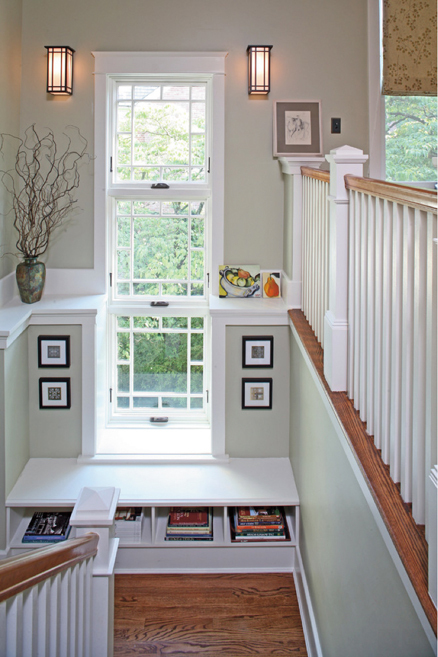 After all, in most multi-storied homes, the stairway is the main architectural element viewed when you walk in the door—maybe yours simply needs a new look. (Can you relate?) It’s still got great bones, but over the years has developed a few squeaky treads and wobbly balusters here and there (and it’s been sporting the same runner since you bought the house back in ’91!). A design makeover can put the spring back in its steps! Depending on the scope of your project, your stairway remodel could take days or weeks to complete, disrupting your family’s day-to-day living. Hiring a contractor who is specifically skilled in stairway construction ensures your job will progress safely and efficiently. Though the ways they are adorned and expressed are limitless, there are basically two types of stairways—straight-run stairways and curved stairways. A straight-run stairway might also feature a turn or change of direction at some point along its flight, marked by a small landing. A curved stairway will glamorously follow a constant arc as it vertically rises between levels. A curved stairway contributes a distinctive open flow of energy between the spaces it connects, while a straight-run stairway gives that firmly grounded feeling of a strongly built stalwart. Most commonly, stairways hug a wall, as it is easier for builders to anchor a stairway into a wall than it is to suspend one (though some homeowners are lucky to have a grand statement-making suspended staircase reminiscent of Scarlett O’Hara’s in “Gone With the Wind”). If your stairway is rather ordinary, don’t despair—there are many things you can do to keep it from looking like a lonely wallflower. Paramount to appearance when it comes to stairways is safety—so, don’t tread lightly when it comes to the idea of building or remodeling a stairway. Stairway construction requires the help of a licensed professional who can keep the appropriate stairway scale and measurements safely consistent and within code. We get in a rhythm when climbing stairs, and even an inch of a difference can be enough to trip us up. The most significant safety feature for stairways is that the steps be of uniform height, though stairway safety guidelines also recommend a minimum tread depth (the horizontal board you walk on) of 9 to 11 inches. Consistency is key to avoid stumbles and falls. Some contemporary stairways completely omit the riser—the vertical board that marks the height between the stair steps—leaving an empty space between the treads. Most building codes require that the space between open risers be fewer than 4 inches to prevent a child from being able to crawl through. If you like that modern look, but have a traditional staircase, you can fudge the illusion of a floating stairway by painting the risers the same color as the wall and painting or staining the treads in a contrasting color, causing the risers to virtually disappear and the treads to command all the attention. Another design opportunity involves accentuating the risers instead. Mediterranean homes often feature colorful ceramic tiles applied to the stairway risers. Collectors of antique Spanish or Danish tiles could enlist a tile installer to help display their collections on their stairway. Or, a talented artist could mimic a similar look by stenciling on designs. 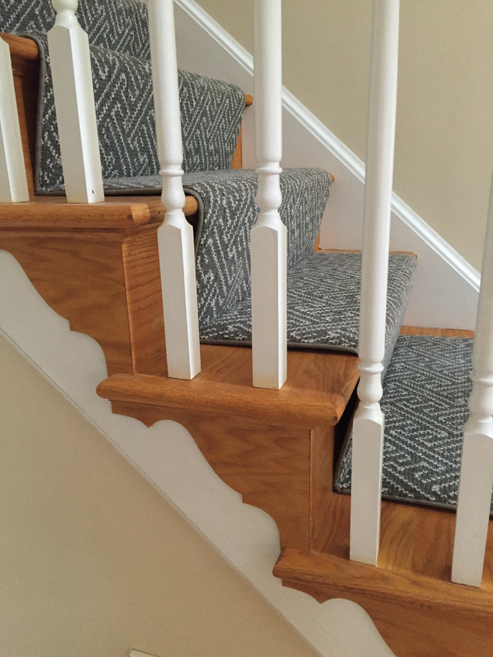 You can purchase decorative wood overlays called “riser covers” to add texture, character and pattern to stair steps. 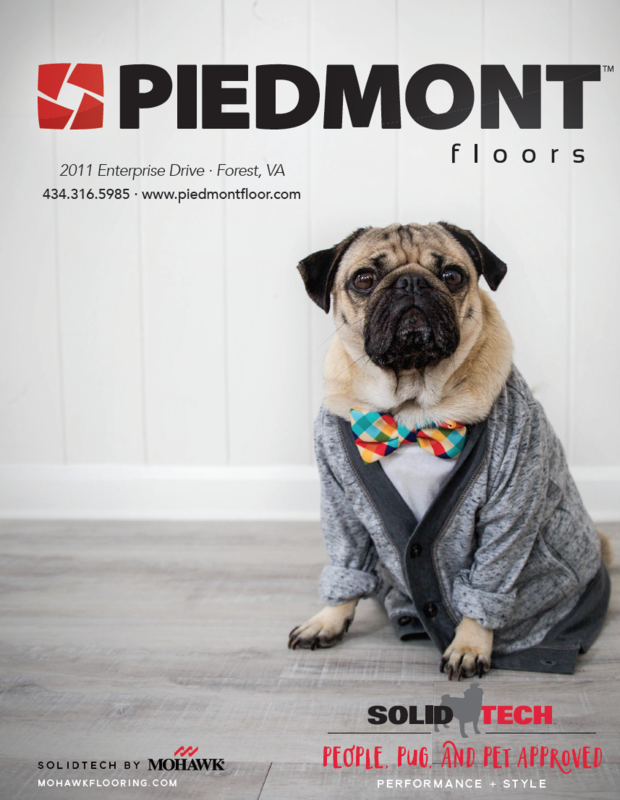 Most riser covers come prefinished to match common wood flooring colors (like oak, cherry, maple and hickory) and many have cut-out designs that can be further accented by painting the riser a bright color before the overlay is attached. Should you soften your steps with carpet or a runner? It’s a matter of personal taste, and many homeowners prefer that “best-of-both-worlds” combo of having hardwood treads partially covered by a runner—exposing a few inches of wood on each side. 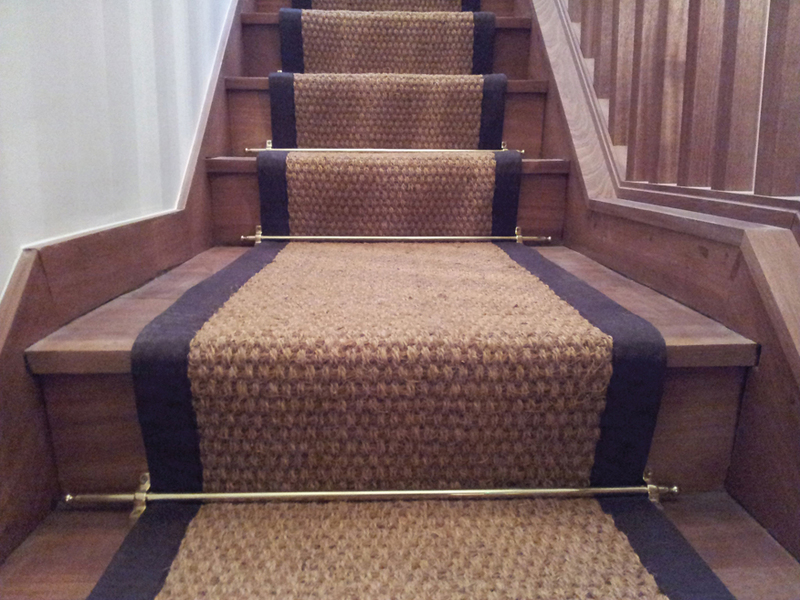 The width of your stairway runner can be tailored to fit your stairs, but standard runner widths are 27 to 33 inches. Brass stair runner rods are a handsome adornment that can be added to the base of each riser, appearing to secure the runner to the steps. 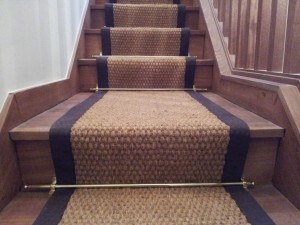 Today, stair rods are ornamental, as carpeting is safely secured to the stairs with nails and staples. But before the days of staple guns and carpet installation pros, the rods had a useful function, too. A stairway covered with a runner is quieter and more comfortable to walk on than plain hardwood treads—less slippery, too! 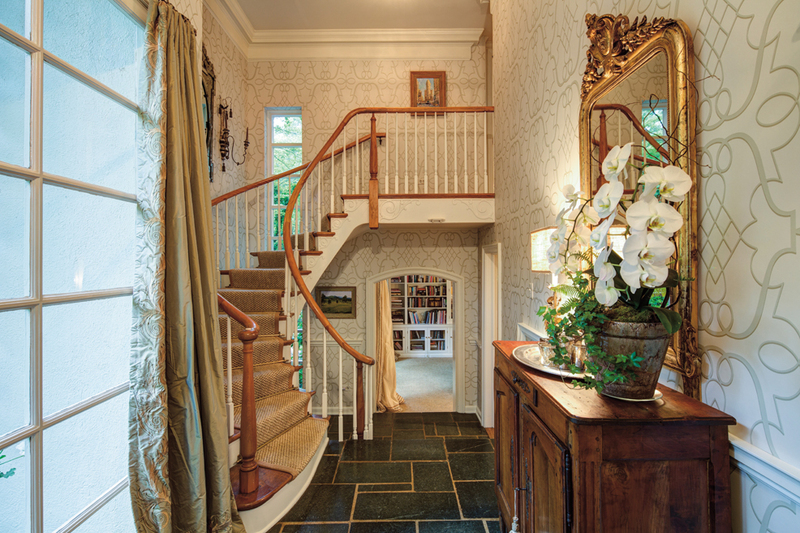 Carpet can add interest to your stairway and today, there are more colors, patterns and materials than ever to choose from—ranging from fine wool carpets, natural materials like jute and sisal, to family friendly indoor/outdoor runners made of recycled plastic—all of which can stand up to high traffic areas like stairways. On the other hand, many people want the polished look of unadorned hardwood stair treads, enjoying the character of the wood as well as the ability to recognize their family members just by the sound of their footfalls. Traditionally, homeowners match their stair treads to their wood flooring, but if you’re going for a more eclectic look, why not stain or paint them in a contrasting color instead? 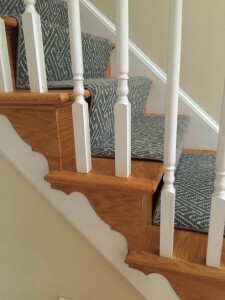 If you have carpet on your stairs and want to remove it in favor of wood stair treads, you have a few options. First, there’s a chance that hardwood treads in good condition exist underneath all that carpet that can be refinished—a time- and labor-intensive task, but worth the effort if it is original wood in a historic home or you are a hands-on do-it-yourselfer. If removing the carpet reveals stained or subpar wood that’s not worth saving, you can completely replace the stair treads—but doing so will require demolition of your stairway’s treads and risers, which means your stairway could be inaccessible for several days (if not weeks). Your family will likely need to relocate during this project. A third and less invasive option is having hardwood overlays designed to fit over the existing, unsightly treads. Overlays can usually be installed within one to two days. Your contractor or local builder’s supply can help have your stairway measured and fitted for a tread overlay system. In order to prevent an accidental tumble down the stairs, stairways are required by local building codes to have a handrail (also called a “banister”) to provide support while ascending or descending the stairs. Customizing the handrail can be the best way to add distinction to your home’s stairway—after all, it’s usually the first part of the staircase that visitors see and touch! Updating yours could transform the look of your entire entryway. A handrail over white balusters (vertical support posts under the handrail, also sometimes called “spindles”, and a grouping of them called “balustrade”) with wood steps and a plush runner may create the most timeless of stairway fashions, but many homeowners want to express a more eclectic look by mixing contemporary elements with classic architectural details. Some even like to make a personal statement through their decor—beach lovers adding nautical motifs and outdoorsmen integrating rustic, natural elements throughout their indoor spaces. Your stairway’s handrail and balustrade can boast intricate carvings and embellishments as long as they remain strong and sturdy. They can be made of stone, reclaimed or exotic woods, iron, steel or other metals. Some are even made of rope, tempered glass or acrylic. But before you get too caught up in sourcing a new handrail and balustrade, contact your local building official, a contractor or even a local builder supply to get the straight scoop on what your local safety code requires of a stairway handrail system. Know that depending on what your local code requires, some of the creative ideas you’ve seen on the internet might not be something you can actually do in your home. A simple update like painting your handrail in glossy black oil-based paint or staining it in a tone to contrast your wood flooring might be a big enough change for you. Or, you might want to exchange it for one made of a completely different type of material. Mixing and matching—for example, pairing a wood banister with rods made of forged iron—can be an eye-catching effect. In fact, you can mix and match the styles and designs of your spindles, too. Alternating two or more styles adds contrast, interest and texture. Architectural salvage shops are great places to look for house parts like banisters and balustrade. You can often find entire stairway sets in styles to complement a home from almost any architectural period. Everybody knows the best part is “the icing on the cake.” Almost as important as the stairway itself is its newel post—both for engineering the stairway and for helping it make a design statement. The newel post is the post to which the handrail/banister is attached and the anchor for the stairway’s handrail. In historic times, the newel post often reflected the architecture of the home, the social class of the homeowners, and sometimes even their interests and occupations, revealed through elaborate carvings and adornments. If you ever see an old newel post with an inlaid ivory or mother-of-pearl button in the center, know that these are called “amity” buttons—an indication that the debt to the bank or builder had been settled. A hole would be drilled into the newel post and the financial papers inserted into it. Some homeowners rolled up their house plans and inserted them in the hollow newel post, too. Secret compartments and hidden documents are certainly the stuff of legends and folklore, but your newel post doesn’t have to be old to tell a great story. 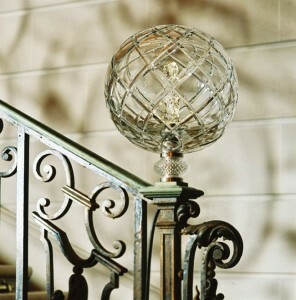 If you can’t find a solid newel post you like or if you want something truly one-of-a-kind, you can have one custom-made out of virtually any material and in any style that you can imagine! Perhaps all your newel post needs is a new topper. A newel post finial—that decorative architectural element marking the top of the newel post—is the exclamation point at the end of your stairway’s design statement. Newel posts can be finished with a simple low-profile cap, or they can topped by a more elaborate ornament like a hand-carved pineapple to symbolize hospitality, a classic ball, acorn or some other geometric shape—even an elegant crystal orb. Adding decorative wood finishing details to an unadorned, plain stairway can be a great project for do-it-yourselfers. Though they look like they’re helping hold up the stairway, they are actually just decorative ornamentation. Tread brackets are decorative carved moldings applied below each tread on the open face of the staircase. They are usually painted white (or the same color as the other wood trimwork in the room) and can be found in an array of traditional architectural motifs ranging from elaborately carved leaf patterns, classic scrolls, Greek keys and others. These are another architectural element that is easy to find in architectural salvage shops, though it’s just as easy to find modern versions made from lightweight polymer-based materials, too. They usually only require a small amount of glue or a few small nails to install them. Once they’re up and painted in your color of choice, it’s one little add-on that will make a big difference in the appearance of your stairway. Adding wainscoting (decorative wood paneling) to the walls is another nice way to visually enhance the line of the stairway and add a layer of protection to the walls, too. Generally, wainscoting is applied at the same height and angle as the handrail. Wainscoting gives a bland stairwell a timeless air of formality. The “landing” of the stairway refers to the floor space at the top or bottom of the staircase, as well as any platform along the way. The landing itself is a focal point—a place where the eye is naturally attracted—and it’s the perfect place to display a significant piece of artwork or an entire gallery wall. Having accent lighting installed to focus on those special items will further enhance their effect and attract onlookers. Anything that piques your curiosity and makes you want to ascend the stairs to have a closer look is the right thing to do to decorate your landing—whether it’s installing a statement chandelier, hanging an oversized mirror or adding a pop of color on the wall through paint or wallpaper. A stairway is a prominent architectural feature in any multistoried home, whether it is small and narrow or boasts shapely, generous curves. There are so many things you can do to customize the appearance of your stairway, making it uniquely yours.